Last night (Thursday 16th November), Lake District Hotels joined forces with Cumbrian business law firm Baines Wilson LLP and Barclays to host a black-tie charity event, at the Inn on the Lake, raising an impressive £18,211 for three local charities. 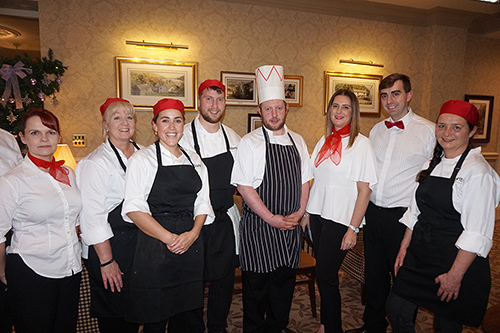 This is the second year that we have partnered up with Baines Wilson LLP and Barclays to host the knife and fork challenge, with the first charity dinner taking place in January 2016 at the Lodore Falls Hotel, which raised £13,305, with Baines Wilson claiming victory over Barclays. 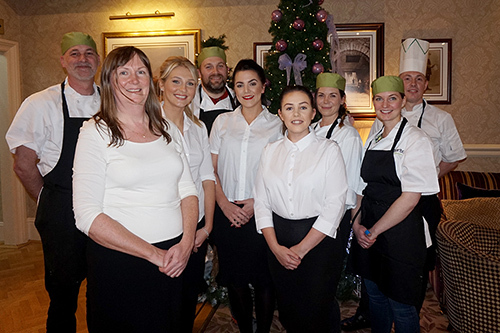 The lawyers and the bankers took over the Inn on the Lake, with two teams of 8; 4 from each team in the kitchen to prepare a delicious 3 course meal, supervised by our Executive Head Chef, Mark Harris and the Inn on the Square’s Head Chef, Dan Lansley. The remaining 4 from each team looked after the front of house to serve 90 VIP guests, who were able to watch the kitchen teams battle it out, from a live stream which played in the 2 AA rosette Lake View restaurant. The evening began with canapés and champagne in the stunning Orangery, with a warm welcome from the General Manager, Gary Wilson and an introduction to the three local charities – Cumbria Community Foundation’s Flood Appeal, Blood Bikes Cumbria and the Great North Air Ambulance. 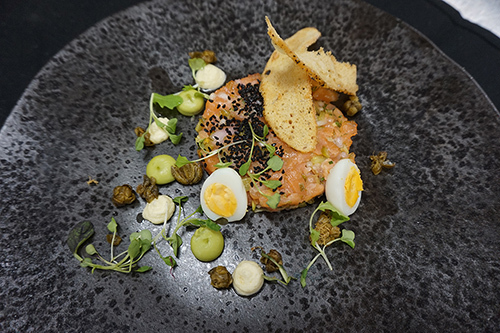 At the tables, Baines Wilson LLP were the green team and Barclays the red team, dinner was served with Eden Valley oak smoked salmon tartare to start, followed by a Lakeland chicken wellington baked in a puff pastry which took a great deal of skill. The meal was then finished off with a dark chocolate dome filled with mocha mousse, served with dark cherries and milk ice cream. The competition was high, but after a close contest Baines Wilson LLP were once again crowned the winners. The efforts of the bankers and lawyers clearly made a good impression as diners paid a donation for what they felt the food and service deserved. This along with money from the raffles and auction raised a grand total of £11,261, which was then match funded with a further £7,000 from Barclays. We are over the moon with the end result, all of the hard work put in from the Inn on the Lake, Baines Wilson and Barclays has really paid off, which will now benefit three local well deserving causes. 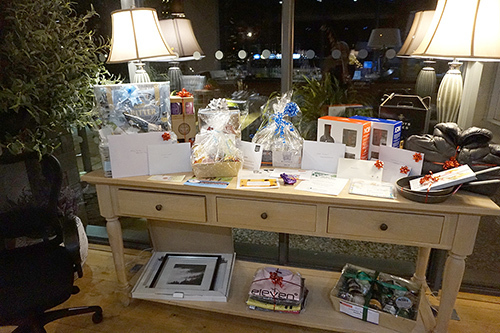 There were some fabulous prizes on offer, which Gary Wilson did justice in a fiercely competitive auction. The fabulous raffle and auction prizes were kindly donated by local Cumbrian businesses: Ullswater Steamers, Lloyd Motor Group, Brimstone Hotel, Jason Chambers Photography, Graythwaite Estate, M-Sport, Manchester United, The Necessary Angel, Eddie Stobbart, Sealy, the Inn on the Lake, The Back Bar, Alliance, The Lakes Distillery, Pioneer Food Services, Lake District Paddleboarding, Honister Slate Mine, Cyclewise, Evergreens Florist, EWGA, Live for Today, Rheged, Whinlatter, Askham Hall, 11 Degrees, The Theatre by the Lake, Windermere Lake Cruises, Treetop Trek, Eden Brewery, The Fizzy Tarte, Living North, Jennings Brewery, John Richardson and Son, Sharrow Bay, Armathwaite Hall Hotel & Spa, CBA Events and Silloth Golf Course.